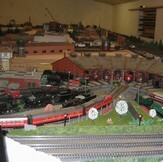 ”I have a Märklin layout of approx 40 m2, with a lot of turnouts, and block sections and many trains. Since the pilot test I used Gamesontrack to automate most of the operation and all demonstrations. Right now I am running 8 trains concurrently with turntable, depot, crane section, and a lot of shuttle traffic between stations. GT-Command is the only tool I know which combines very simple setup, easily understood descriptions, and very quick testing of even complex connections. My layout is used by many players during hobby evenings and I appreciate the ability to combine playing with automatics. It is simply genius. What is really cool about Gamesontrack is that you can keep your eyes on the traffic and need keep them on a display. Furthermore, it creates life on the layout, and it allows you to play the role you like the most - - - for example a stationmaster, a dispatcher, or just operate the heavy steam loco. All other roles can be automated. As an example can I put three locos in fixed shuttle while arranging a heavy goods train with a lot of wagons, and get the new heavy train on the tracks interacting with the already automated operation. Or I can have more trains running in separate directions, have them synchronized at the station. So far I do not have signal control but imagine being a traffic manager who manages automated departures and arrivals on a station simply by means of signals. The monitoring becomes better and faster when your eyes are on the layout all the time, controlling can be mixed. As an example is it the most easy thing to do slow shunting letting the train go buy the Intellibox in my case, and let all the points and turnouts be controlled by voice. Section/block drive is perfect for voice control. I was quite exited when installing Gamesontrack on my Mac. It is a windows program but I have installed a program called Parallels on my Mac allowing a Windows program to operate on the Mac system. Parallels Desktop is very simple to set up. When Parallels is configured, you can install Windows on a virtual engine. Then you need to run a little setup program called Parallels which again selects the right graphic card, network, ports for headset, etc. One challenge was the sound for Gamesontrack. My computer is placed approx. 2 meters away from my model railway, and the headset has a cable of approx. 2 meter. On top of that I wanted the Windows part set up for the headset while the Mac was using normal settings. And my current Mac does not have a mike input with a standard headset connection. I used a solution with a USB unit "iMic" from Griffin Technologies (www.griffintechnology.com) and it turned out to work perfectly. I connected and extended the USB so the Microphone could stay close to the railway. IMics does not require drivers and worked immediately. In Parallels I selected the Windows sound input and output for iMics and after restart, it all worked. Gamesontrack was installed without problems and I could use the headset at once. My Märklin CS has a fixed IP which I entered to Gamsontrack. With a little exercise I learned to pronounce the words so that Gamesontrack could understand them. The most incredible is that you can run Gamesontrack and Simple Digital Locomotive in Mac OS on the same machine. Both programs can communicate with the CS and execute the commands. 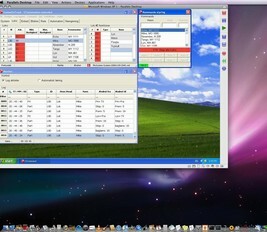 A Mac using an Intel processor and Windows XP and Parallels can do all other kinds of activities, such as surfing, play music and other programs while Gamesontrack is running. An interesting advantage when running Window in virtual mode is the saving of snapshots. It means that you can save your current settings while you adjust Gamesontrack, should something go wrong, you simply return to your earlier snapshot and you are live again. All in all a positive experience and easy to get going. I took the chance to join the pilot programme when it was offered to me back in August. I have been using Win Digipet (WDP) for many years and I wanted to see how well GT-Command stacked up against WDP. The installation went very quickly and soon it was clear that this program was very simple and very advanced at the same time. GT-Command makes no fuss – very similar to an old DOS program with its simple tables. But do not be fooled. Before you know it your first train is running and if you wish to use voice control, this is even as simple. You get a good feeling in your stomach and want to learn more. Again you press a data collection button and suddenly your S88 ports, your locos, and all accessories you have used are registered and organized in the system. No coding and only naming. If you want automatic operation there are no strange commands and everything is scripted and easy to understand for a model railway guy. I am most exited about this little new program, hard to write anything negative - - but there is room for improvement. Gamesontrack listened to the test pilots’ feedback and the developers changed it accordingly.